Your rug matters more than you think. 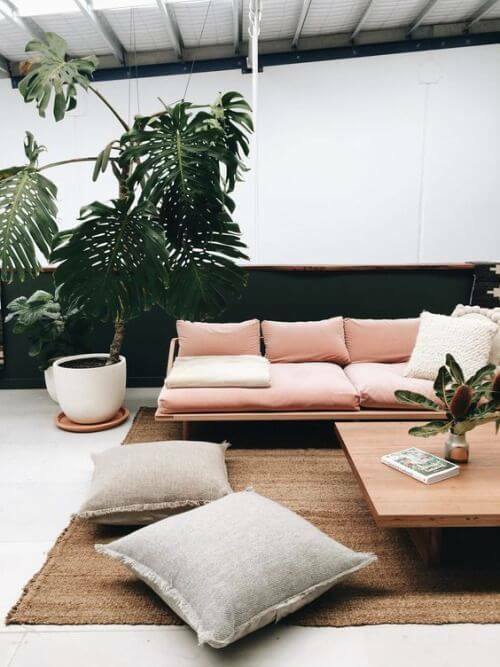 It might sound easy, but shopping for your outdoor rug is one confusing and difficult part of designing and decorating your alfresco area. There’s a lot of options in the market and some find it hard to pick one for their space. In this blog, we’ll reveal everything you need to know about using outdoor rugs. We’ll also give you tips so choosing your rug becomes easier for you. It’s an easy and inexpensive way to add life and style to your outdoor space. It cushions your foot from the pavement that becomes hot and cold, depending on the weather. The rug covers the deck wood or patio pavers beneath it, protecting it from prolonged exposure to the sun which causes fading. It’s also a great way to cover ugly outdoor surfaces. The purpose of an outdoor rug is similar to an indoor rug. Therefore, everything that you will learn after this is applicable inside the house as well. This is the part that most homeowners find confusing so we’re going to explain it step by step. First, pay attention to the architecture of your outdoor area. Do you have eye-catching elements such as an outdoor fireplace, fire pit, or a fountain? If you do, make it the central point of your outdoor area. Plan a seating or dining area near or around it. The way you use your space will help you determine the right rug for your space. For example, round rugs complement circular patio tables. Square or rectangular rugs accentuate a grouped outdoor seating better. The rug must be large enough so the two front legs of each seat stay on it. 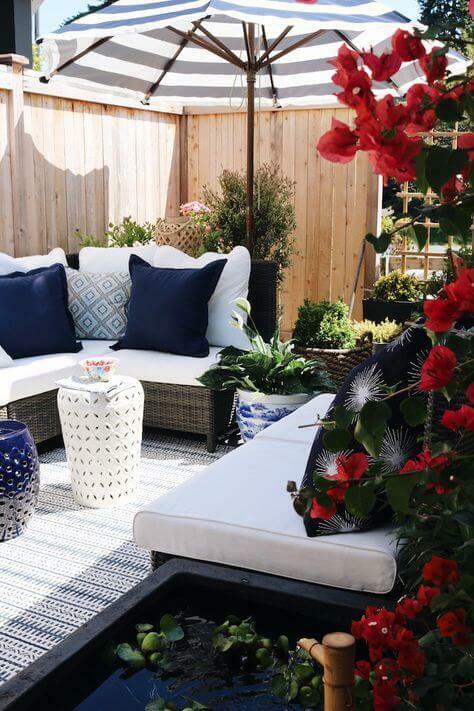 This look brings all the seats together, creating an intimate area within your outdoor space. You can also place all four legs of your sectional seating on the rug. However, you need an oversized rug to make this happen. You should leave 8-18 inches of your rug exposed so you can successfully bring all the pieces of furniture together. 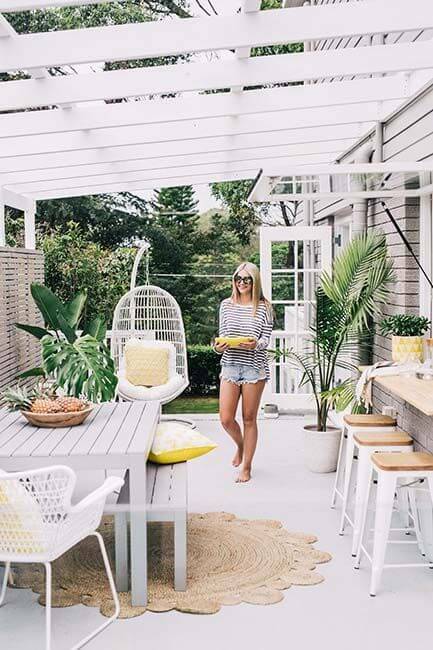 Do this if you want a more open and conversational seating area outdoors. Planning to put a rug in your outdoor dining area? Lay a rug under the table that’s at least two feet (24 inches) wider than it on all sides. All the legs of the chairs must remain on the rug. No leg should fall to the edge of the rug when the chairs are in use. Based on the discussions earlier, your outdoor rugs should be big enough for your space. A large outdoor rug to makes your alfresco area feel larger. This also keeps your outdoor area clean and manageable because it covers the majority of your deck or patio. Natural fibre rugs work in almost all design styles. Most homeowners find its appeal irresistible. The material’s textures and colours fashionably transform any space. Unfortunately, not all natural fibre rugs are fit for outdoor use. We recommend the use of rugs made of jute, bamboo, and sisal for they are the most durable of all the natural fibre rugs. Clean them thoroughly and it will last for a few years. Avoid using cotton and wool rugs outside for it absorbs moisture fast, causing it to mildew and rot in a few months! It’s best to use these fluffy rugs indoors, where you can enjoy them longer. Here’s where synthetic rugs come in. You can find synthetic rugs that look like wool and cotton in the market. Fake wool and cotton rugs are mostly made of polypropylene, polyester, and acrylic fibres. These are more hardwearing than their natural counterparts. The rug’s colour is more vibrant. They’re also easier to clean. However, they’re not as soft and plush as natural cotton and wool. Some flat-woven synthetic rugs feel like plastic. Price-wise, synthetic rugs are more affordable than real, natural fibres. Synthetic rugs also come in a lot of patterns and colours. Apart from a natural fibre look alike, rugs with geometric, graphic, and floral patterns are popular outdoor rug choices for homeowners. Look at the quality of the weave. A high-quality outdoor rug’s fibres are densely entwined. Rugs with a loose weave and distorted sections are substandard and not worth buying. Top-of-the-line rugs don’t slide when you step on it too. Outdoor rugs, whether made from natural or synthetic fibres, are designed to withstand heavy foot traffic and changing weather conditions. You don’t need to worry about it from time to time. Just keep them dry and don’t forget to wash them often. Getting the rug right is only a small part of building your alfresco. We can help you design the entire area too! Ask for our designer’s help! 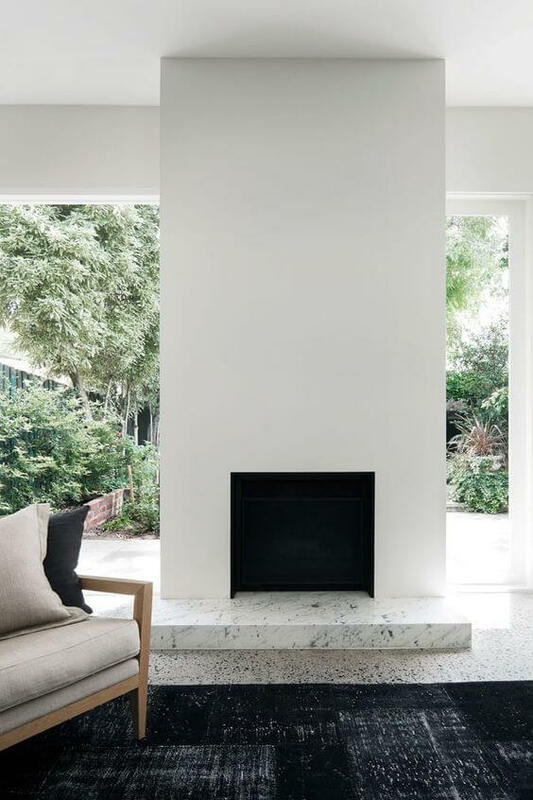 Talk to a building designer from Perth.